When Does Twenty Four Hours Equal Six Seconds? When you're an animator, that's when. I just finished a six second shot for The Girl and the Ghost that took twenty-four and a half hours of work over four days. I'm relieved it's done, but wow, talk about tedious. Funny thing is, it's not a terribly complex shot as you watch it, it'll most likely blow right by and nobody will even suspect it took so long. I suppose that's what should happen if I'm doing my job right. There's the challenge. Once this thing's finished and online, watch it and enjoy it. Then watch it again and enjoy it more. Upon the third viewing, if you're the first one to correctly guess which shot I'm referring to in this blog entry, you win...something. I don't know. My praise? Fame? Fortune? We'll figure something out. Another hundred plus hours have flown by already. Last night, I surpassed the total amount of time I spent on Batman's Gonna Get Shot in the Face. No turning back now, eh? I really need to post an image or a trailer soon. Aaron's recording his part today out in North Carolina. He seems really pumped to do it and I'm excited to hear how it turns out. The first actual voice work for this short, it's taking shape. Short blog. No rest for the animator, baby. My life has consisted mostly of frames, keyframes, and tweening for these last few weeks. The Girl and the Ghost has been eating up a ton of my time lately (I've even put in a couple 10 hour days) and honestly, I'm really happy about it. It's still pretty far from finished, but I get more and more excited as it continues to take shape. I really feel like I'm accomplishing something special, even if it's only on a personal level. I normally tend to shy away from watching animated films while I'm animating, to avoid intimidation, but that seems to have changed this time around. I re-watched Princess Mononoke a couple weeks ago and actually energized rather than inferior. Sure, my designs aren't as intricate and I don't have the dynamic action scenes, but they had hundreds of people working on that film. I'm just one and I feel my project is already looking pretty impressive. I'm excited. 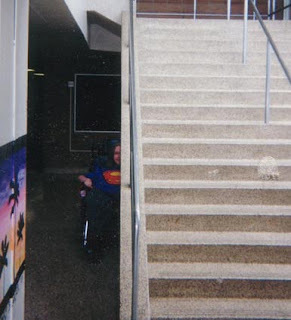 I visited my old high school again a couple weeks ago to say hello to the remaining people there. So many people have retired since I graduated seven years ago. It's strange going in there and not recognizing most of the faculty. It's also strange to think I've been out of school for seven years. Everyone there seems to be doing well. It was great seeing familiar friendly faces. It felt amazing to tell them what I've been doing with myself these last couple years. 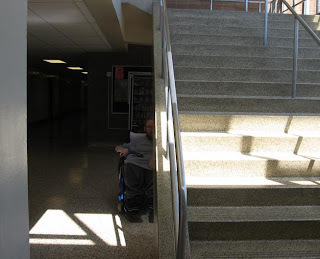 Before leaving, I had to head down and visit my old spot under the stairs. Mom and I went and saw Fantastic Four: Rise of the Silver Surfer on Friday. I had such high hopes for the first Fantastic Four movie and felt so let down when I finally saw it. So, naturally when I started seeing trailers and clips for Rise of the Silver Surfer and thought it looked cool, I couldn't help but be a bit wary. I was looking forward to it, but didn't want to feel that same disappointment again. I know the movie isn't Oscar material (though the Silver Surfer effects may be), but I had such a blast watching it. Sitting in that theater, I felt relaxed, entertained, and totally de-stressed for the first time in I don't know how long. It was a fun ride of a movie. The only real remaining annoyance from the first movie was the lame interpretation of Dr Doom, who didn't really need to be there at all. And that voice...if you're using a villain who wears a mask, at least use an actor with a somewhat intimidating voice. Yesterday was Jeff's high school graduation party. It was a good time just chilling outside in the perfect weather while eating good food and visiting. I can't believe Jeff is out of high school. Back to animating for me. Happy Father's Day, y'all.